Superb and grand home on an elevated position with amazing sea views. High-standard facilities such as a private cinema, gym, sauna and spa. Ten minutes from Chaweng town. 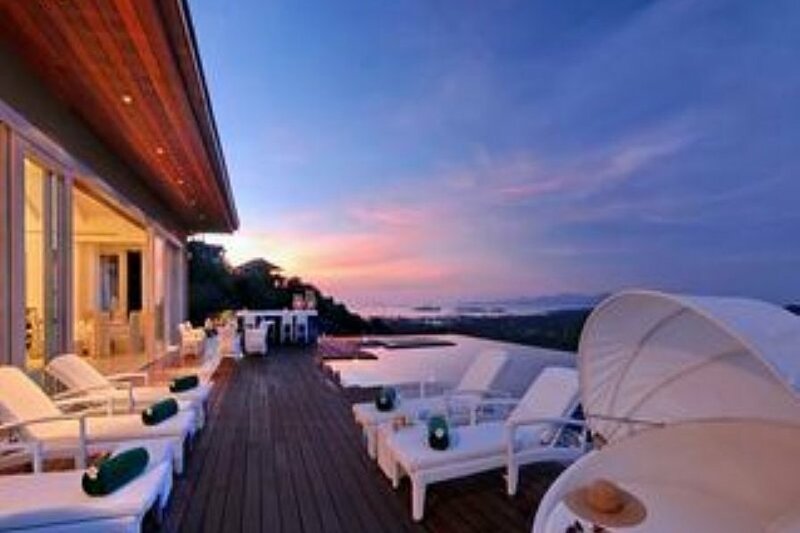 This Villa is a fabulous grand home of immense proportions, with 180 degree panoramic sea views across the entire north-eastern peninsula of Koh Samui. The fully air-conditioned property features lofty double-vaulted wood-panelled ceilings and slide-away floor-to-ceiling glass walls. It is conveniently located between the islands best beaches of Choeng Mon and Chaweng, this gorgeous villa offers impressive facilities and sets new standards of luxury. It is the ultimate hillside hideaway on the island, and an ideal venue for parties seeking privacy, luxury, and seclusion. The panoramic sea views are particularly dramatic, and the elevated hillside position provides fresh sea breezes for most of the year. An ideal property for friends and family alike, this superb villa is unique in design, concept, scale, and facilities. A private driveway leads up to the property, which is entered through imposing oversized wooden gates onto a serene shady central courtyard garden with ornamental ponds, palm trees, sculptures, and seating. Four of the villa’s five master bedroom suites have independent entrances off the courtyard, and directly ahead, the vast open-plan living room is entered through huge double glass doors, with a view through to the pool and sea beyond. The voluminous living room features a 7 metre peaked ceiling, with a central black chandelier. Wraparound glass walls face the pool deck, and provide great light as well as fantastic sea views in all directions. Lounge and dining areas are located at the front of the living room, facing the pool. The lounge comprises deep, low, and sumptuous sofas arranged around a large coffee table. The elegant dining area features a round table seating up to 10 in comfort and style. Sliding glass walls open fully to create a seamless indoor-outdoor living space. A fully-equipped kitchen is partially partitioned by an island storage cupboard at the rear of the living room, and includes an espresso machine. On a raised mezzanine at the rear of the living room is a TV den, with a large LCD TV and a cushioned daybed. A guest bathroom with walk-in rain shower is located beneath the mezzanine TV den. Complimentary WiFi internet is provided throughout the property. The 4 oversized bedroom suites on the main floor are of the same design, each with double-vaulted wood-paneled ceiling, slide-away glass walls, sea views, built-in wardrobes with safes, King-size platform beds, and large satellite LCD TV/DVD and sound systems with iPod docks. The fabulous en-suite bathrooms feature large sunken bathtubs, twin sinks, chandeliers, and walk-in rain showers. The expansive wooden pool deck wraps around the living room, and provides access to the bedroom suites. The pool deck is furnished with cushioned sun-loungers, and an al-fresco dining set seating 10, and features a BBQ kitchen. The pool deck is surrounded by glass barriers for uninterrupted views, and the overhanging roof provides shade in the afternoons. The 18 metre long swimming pool features infinity edges on 3 sides, following the sea view. Two island platforms in the pool can be furnished with circular double lounge beds for private retreats from which to contemplate the views. Stairs lead down along the side of the pool to the lower level, which includes a fifth en-suite bedroom, cinema, gym, spa treatment room, and sauna. The lower bedroom suite features a King-size platform bed, built-in wardrobes, satellite LCD TV/DVD, and a free-standing terrazzo bath tub. The ultimate treat for film-buffs, the cinema features tiered rows of super-luxurious leather club chairs, a large projector screen, and state-of-the art sound system connected to a computerized digital library of thousands of movie titles. At the far end of the lower floor is a spa room for massage and beauty treatments, together with a sauna and rain-shower. Complimentary massage is available. The villa is located on a hillside, about 10 minutes drive from Chaweng, 5 minutes from Choeng Mon beach, and 10 minutes from the airport, with Santiburi Golf and Country club some 30 minutes drive away. Chaweng is situated on the east coast of Koh Samui and is a popular and trendy destination with young travellers and families alike. The resort is well known for its beautiful white powdery sand beaches and turquoise waters. It is only 10 min away from Fisherman’s Village in Bo Phut. It is very popular place for the tourists to congregate in Koh Samui. This is probably due to its incredible choice of great restaurants and bars. With a distinctly Mediterranean feel it, this town also boasts some nice resorts and a few of the islands top hotels can also be found here. All airport transfers to and from the villa are complimentary. You will travel by private car or minibus directly to the location. Rates are inclusive of continental breakfast, in-villa chef service and massage therapist. Rates are subject to a 10% service charge and taxes of 7%.